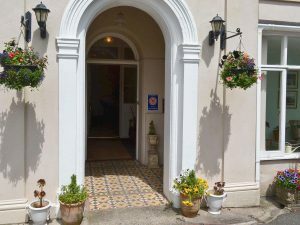 Laurel Cottage is one of our Torquay self catering cottages. It has wifi internet access and cable TV with plenty of channels Pets allowed. We recently stayed in a cottage in Torquay in Devon, which he really enjoyed. The cottage was in a great location for getting to the beach and also other amenities such as restaurants and a pub. 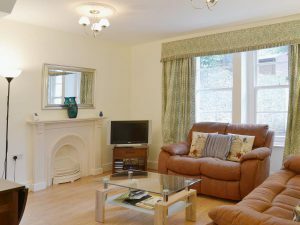 The cottage had clearly been refurbished recently as the standard of the decor was very high and the cottage was very comfortable. It really was like a home from home! The sofas and the beds were very comfortable. We were particularly impressed by the fast wifi broadband. The kitchen was very well equipped and included a washing machine and dishwasher. We travelled as a family of 2 adults and 2 children and we booked through Karen from Holidays4U as a celebration for my husband’s 40th birthday. The booking process was very straightforward and easy. We came in one car, but there would have been room to park 2 cars if needed. We were also lucky with the weather and were able to spend several days at the beach, which our children loved. Most days we went to Meadfoot Beach. This cottage is also dog friendly. The owners allow a total of 2 pets. It’s lucy as we have a labrador and a cockapoo. The owners also left us a welcome pack which was a nice touch. It meant we could relax and have a drink on arrival, before having to worry about going shopping. We were travelling from the North of England, so we didn’t arrive until late. Because it was my husband’s birthday celebration we went out one night to Memories Bistro, which is in St Marychurch. The food was amazing and I can highly recommend it. But as we have been to Torquay many time, we knew it would be important to book several weeks in advance. This studio is one of our Torquay holiday lets. It is situated in the Wellswood area which is close to the beach and harbour. Although only a small little studio, we thoroughly enjoyed our holiday. It felt like having a room in a large villa. The original features were stunning especially the entrance hallway and staircase. The garden was very large and well maintained. We will definitely return again. We booked through Karen from Holidays 4U, who was very efficient in dealing with our enquiry. We originally enquired about a different property which was not available, and Karen emailed a list of suggestions and alternatives. We really enjoyed the area of Wellswood. It has a lovely selection of restaurants. There was also a wonderful little cafe which was part of a pattiserie. They also sell lovely chocolates. The nearest beach to where we were staying was Meadfoot Beach. It was great to walk along the sea front and watch the sea lap against the sea wall. The beach is very family friendly. But be aware that if you walk down the steps from the sea wall to the sand below, you need to watch the tide very carefully. We walked around the corner and we almost got trapped as we didn’t notice the sea was coming in. Luckily a diver walking past warned us. By the time we got back to the steps, the water was covering the sand by about one foot. As it wasn’t too rough we were able to wade in, to reach the steps and to safety. Another day we visited Kents Cavern, which I would definitely recommend. A little further afield, Babbacombe Model Village is also worth visiting and Bygone Days where you can walk through Victorian streets and look in the shop windows to see all the produce and products that would have been sold in the day. It’s quite amazing to see how old some of our famous brands are! 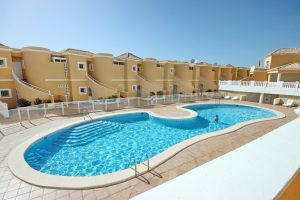 This luxury two bedroom apartment is one of our Benimar apartment rentals. It has air conditioning, wifi internet access and satellite TV. We have been to Tenerife many many times. But this last holiday has been the best yet. The apartment was as described. Pure luxury! First to describe the location, the complex is set back a little, but the right side of the motorway. It is equi-distant from Fanabe Playa and Del Duque Playa, so in that sense it is very well located. The complex is quiet and peaceful, so if that is what you need, then you can’t go wrong. If you want luxury then I can highly recommend this apartment. It has all the extra. There is wifi internet access, satellite TV with lots of international channels including English, air conditioning, and top brand appliances in the kitchen. We paid a small deposit and the balance had to be paid on arrival. People talk a lot these days about guarantee from fraud. But really this is the simplest guarantee. What could be better than only paying the majority of the money at the point that you see the apartment? 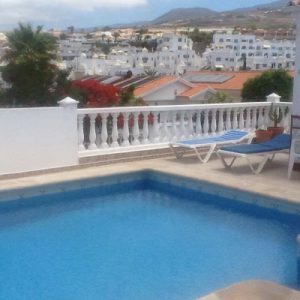 We booked through Karen from Holidays 4U and would definitely re-book this apartment if it is available next time we want to book our holiday to Tenerife. I travelled with my wife, my sister and her husband, so the double beds in each bedroom were perfect for us. It was also great that there were 2 bathrooms. The balcony was great. It was very large with good quality patio furniture, including a patio table and chairs and sun loungers. The balcony overlooked the pool, so it was nice to sit out as the view was good. This one bedroom duplex on Parque Santiago I is one of our Las Americas apartment rentals. The complex is one of the most popular in this resort. We have just returned from a lovely holiday on the Parque Santiago I complex. We thoroughly enjoyed the holiday which we booked through Karen Durant from Holidays4u.org. Karen booked a duplex one bedroom apartment on Parque Santiago I. Although it didn’t really have a sea or pool view, it was very comfortable and clean. 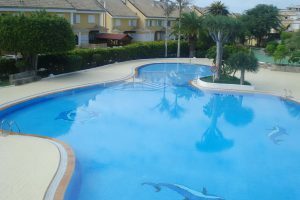 The complex is very well maintained with a lovely pool area. Getting a sun lounger was sometimes a challenge though. As the complex was on the sea front, it was very conveniently located. The beach was a short walk, as well as restaurants and bars. We did hear a bit of music a night, but it didn’t bother us as we came to Tenerife to enjoy our holiday. The only slight niggle was that there were no lifts to the 3rd floor, so it was a bit of a trek. But as we are in our 40s, we didn’t really have a problem with it as such. It was just a bit tiring in the heat to climb all those steps. Not so difficult coming down of course. It’s best to book early as we did, as the privately owned apartment can vary in price quite a lot. Karen told us the owners set the prices, so it doesn’t always follow that a more expensive apartment will be nicer. So we looked carefully at all the available options and looked at the photos on the website, compared the prices and made our decision. We will be booking a return visit with Karen in the near future and would definitely recommend this holiday and her services to other guests. This studio is one of our Malibu Park apartment rentals. The apartment has been nicely decorated and is available for holidays. We have just returned from our second holiday on Malibu Park. This time we booked a studio, which we got through Karen from Holidays 4U. She recommended the studio in particular as it has just undergone a full refurbishment and it really was lovely inside. The staff were very friendly. The pool bar, called the Splash Bar, serves great food and drink and is very reasonably priced. The apartment was well equipped and the linen and towels provided were of good quality. The pool area is nice and there are life guards on duty. There are plenty of sun loungers, so you don’t have to rush or reserve them, like on some complexes. Also the life guards are very helpful with moving them as necessary. I would have to point out though that the complex is across the motorway and in quite a hilly area. So it wouldn’t be suitable for anyone with mobility problems. But it wasn’t a problem for us. We were also very lucky with the weather during our stay. There is a mercadona supermarket as well as an Iceland, which are only a short walk from the complex. It is also close to Siam Mall, which is very good for shopping. And of course it is also a short walk to Siam Park. Aqualand Water Park is just opposite. We visited Siam Park and Aqualand during our holiday. It was great fun. There is also free wifi internet access available on the complex. 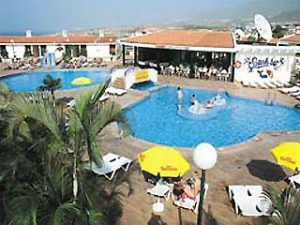 We will definitely be returning to this complex for our next holiday, providing we can find a privately owned apartment which is available. We prefer to book one of the private ones as they tend to be better equipped when it comes to cooking utensils, pots and pans etc. 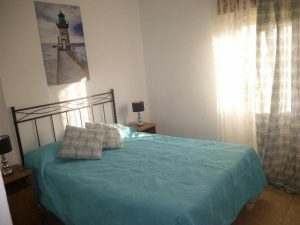 This one bedroom apartment on Altamira is one of our Del Duque holiday lettings. It is on the 3rd floor and enjoys a pool and sea view. 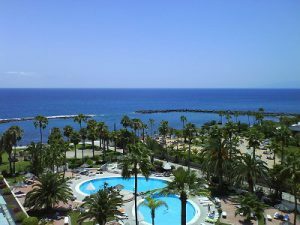 I have just returned from a 2 week holiday in Tenerife. I stayed on the Altamira complex with my partner. We chose this complex as we used to holiday here around 10 years ago, but because of family health issues we hadn’t returned until this month. 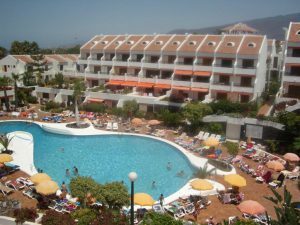 We were not disappointed, the complex is still as lovely as ever and we thoroughly enjoyed our holiday. We booked through Karen Durant from Holidays 4U. The apartment was privately owned. It was on the 3rd floor and enjoyed amazing sea and pool views. I would say the view was one of the best on the complex. The only way to better it would be to be on a higher floor. The complex is well maintained and there are 3 pools. There is also a restaurant which serves very good food. It is nice to walk along the promenade, as the complex is right on the sea front. In just a few minutes you reach Playa del Duque. In my opinion this is one of the beaches on the island. There are sun loungers and sun umbrellas which you can hire, but the beach is not big and never over crowded. The arrangement with the wifi was a bit strange. You have to ask for the password every day as it changes. It wasn’t even very fast, so it could be a bit frustrating. But as I have a smart phone, I was able to use the wifi hotspot on my phone instead, which was a lot better. I am with Vodafone and they only charge £3 per day so you can use the data on your bundle.